Eco Garden Maintenance love mulching lawn mowers, mulch mowing is in our opinion the future of grass cutting. Mowing your lawn and returning the clippings to the soil has become much more popular in recent years as people become more environmentally aware and realise that their lawn can benefit greatly from adopting this approach. It must be stressed that mulch mowing has to be done properly in order to reap it's rewards whilst avoiding the problems associated with bad practice. Just removing the grass box from your mower and letting the clippings fly will not produce the desired results. Long grass clippings which sit in clumps on your lawn not only looks unsightly but shades out the grass and can lead to problems with excessive thatch and disease. Also, not all lawn mowers are suited to performing the mulching operation to an acceptable degree, regardless of what the manufacturers literature tells you. did I say it was organic? Good mulching mowers are designed with effective mulching as their first and only priority. A conventional mower with a mulch plug fitted (available for most mowers) is not usually a good mulch mower. At Eco Garden Maintenance we have tried fitting mulch plugs to some very expensive professional lawn mowers and the results have been ok but no way near as good as a properly designed mulch mower. Unfortunately in our opinion, non of the cheap dedicated mulch mowers available at home improvement stores and the like are up to the job. 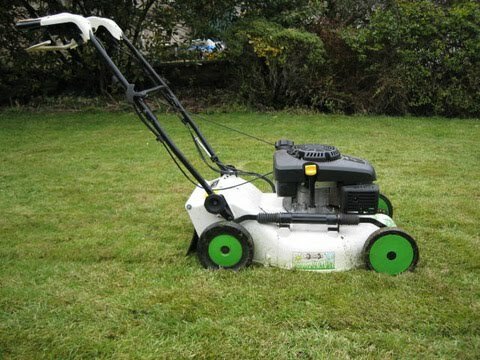 Eco Garden Maintenance believe mulch mowing to be the best way to maintain a healthy and attractive lawn as long as it is done effectively with a professional grade machine which has been designed exclusively for mulching. Mulch mowers cannot perform miracles however and make huge amounts of grass top growth disappear. The lawn must be cut regularly in order that not too much grass is taken off in one go and the cutting height should not be too low so that there is somewhere for the fine grass clippings to be dispersed. Done properly, mulch mowing will not result in excessive levels of thatch as long there is adequate soil life available to break down the grass clippings and incorporate it in to the soil. To help in this respect any additional fertiliser added to the lawn should be organic and use of harmful chemicals such as moss killer, fungicides and selective herbicides should be kept to an absolute minimum. Please contact Eco Garden Maintenance to enquire about our lawn mulch mowing service and what can be achieved.